Red Roof Inn is renovating all of their inns nationwide! This location now features redesigned rooms with more comfort and added amenities such as T-Mobile wireless Internet access (daily fee may apply). 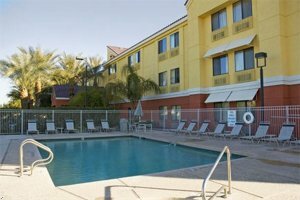 This Red Roof Inn is located just 4 miles from the Phoenix Sky Harbor International Airport and within minutes of Diablo Stadium, Arizona State University and Firebird International Raceway. The Inn features an outdoor pool and hot tub, and suites with microwave/refrigerator. Located 8.3 miles southeast of downtown Phoenix and 2.0 miles west of downtown Tempe. Traveling on I-10 East: Exit #153. Turn left at the second traffic light (Broadway East). Turn left again on 52nd Street. Turn left again at 15th Street. The Red Roof Inn is on the left. Traveling on I-10 West: Exit #153-b proceed straight through the traffic light and turn left on 15th Street. From Phoenix Sky Harbor Airport: Follow the signs for the East Valley exits. Travel SR 143 South and turn left onto University Drive. Turn right onto 52nd Street and then right again onto 15th Street.